Mr. P. and I traveled to the Houston, TX area for a family wedding the first week of November. The wedding was in Katy, TX, about 45 miles west of the airport. We found ourselves with idle time on both Friday and Saturday of the planned weekend events. What to do? Google "best antique stores Katy TX" - BAM! Let's go shopping! 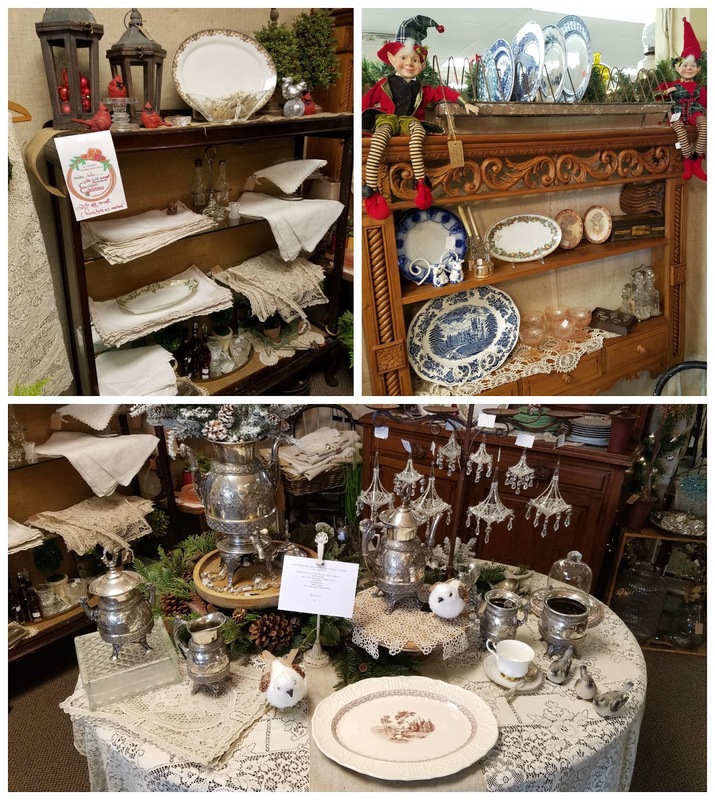 I chose KT Antiques, arrived at 10 am and, as fate would have it, it was Christmas Open House weekend. Most dealers were having 20% off - yippee! 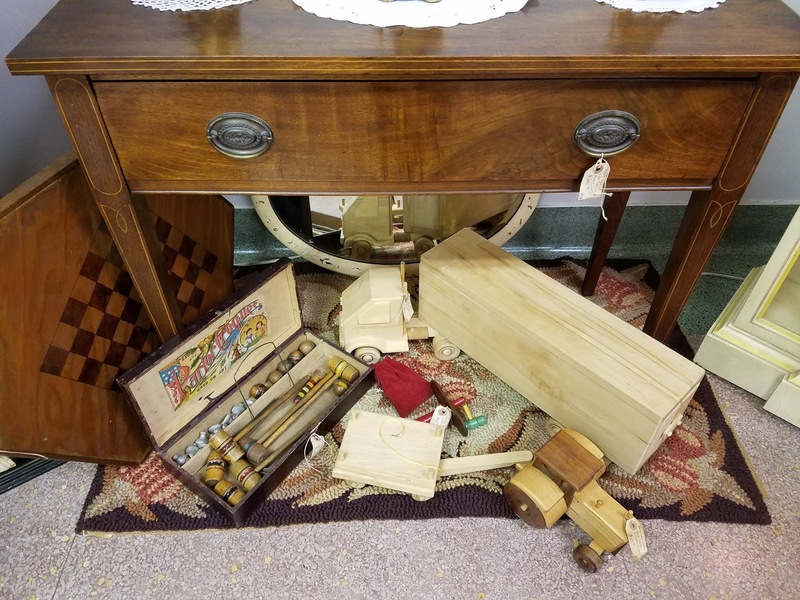 KT Antiques had some great dealers with equally great displays and great stuff, so I thought I'd share some of what caught my attention. Pictured above was an adorable woodland mannequin tree in one booth, while the frames on right were the displays in the store's front windows. 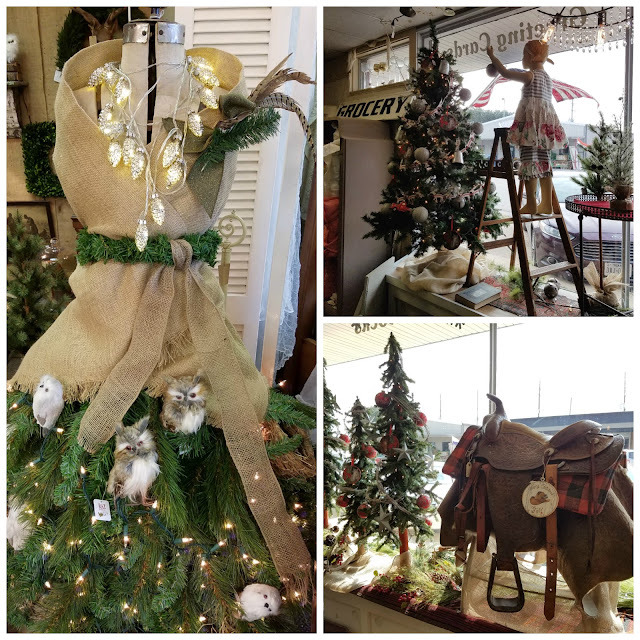 I loved them both - a child mannequin decorating a tree full of new ornaments, and a cowboy Christmas theme in the other window. 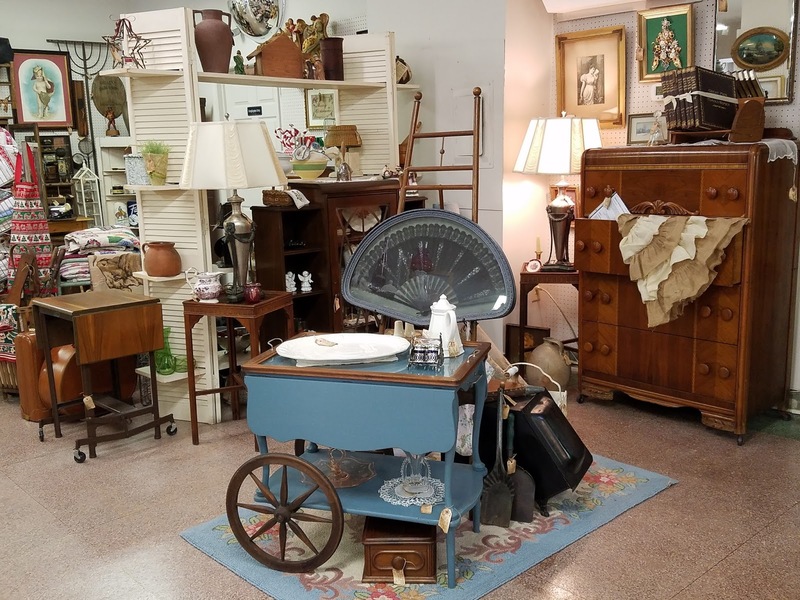 This store had a few dealers offering a mix of vintage and new retail items. Normally, I take exception with a shop calling itself an antique store and promoting new items, but the dealers who did this (mostly in the space at the front of the store) did a really fine job of merchandising display. One, in particular, caught my eye with her merchandise styling. 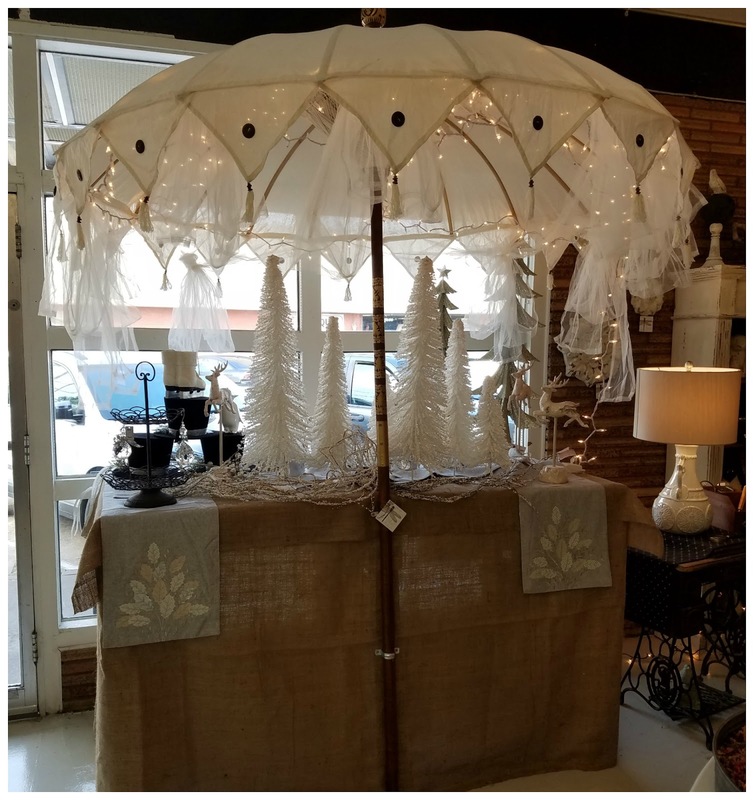 I loved how this dealer used the suspended screen door above her booth space and had grapevine boughs with lights on top. So pretty! 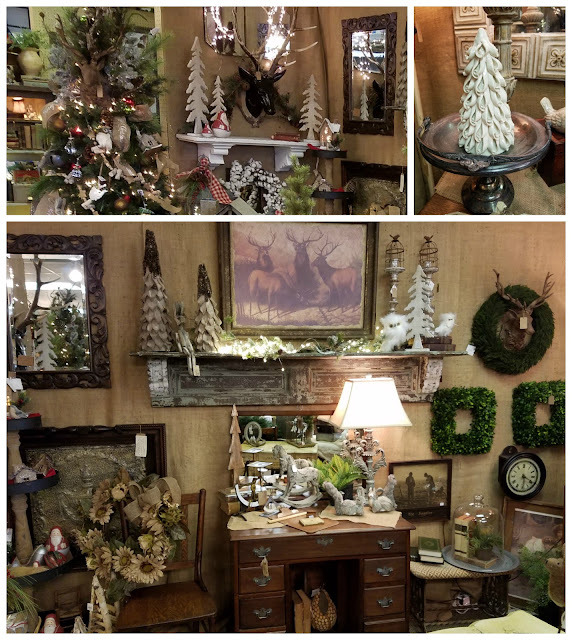 Her items were a mix of new and old, and the woodland Christmas tree (pictured above) was also in one of her spaces. The photo above shows some of her items in a little more detail. Look at those tiny chandeliers suspended on the table - those are ornaments! 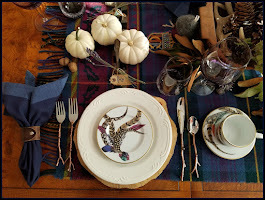 Nice vintage linens, transferware, and silverplate. Directly across the aisle, the same dealer also had the space pictured above. She did a fine job of mixing antiques with new merchandise. I loved the spaghetti-style ceramic tree in the top right frame seated on the silverplate sweet meat basket. The tree was new, the basket vintage. 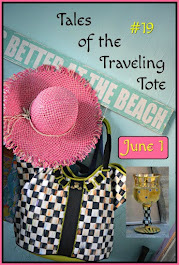 I had to think hard about what I chose to purchase, as we traveled by air, and I had limited room to pack and carry on. Once back at the hotel, I received a call from KT Antiques, telling me they pulled my name for a $25 gift certificate to one particular dealer. Back to the store I went! That dealer had also recently opened a store across the street called Ruizstudios, and I was able to shop either her booth at KT or her new store! 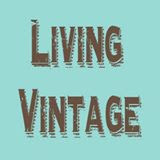 Let me show you around her lovely store where most of the merchandise is new, not vintage. 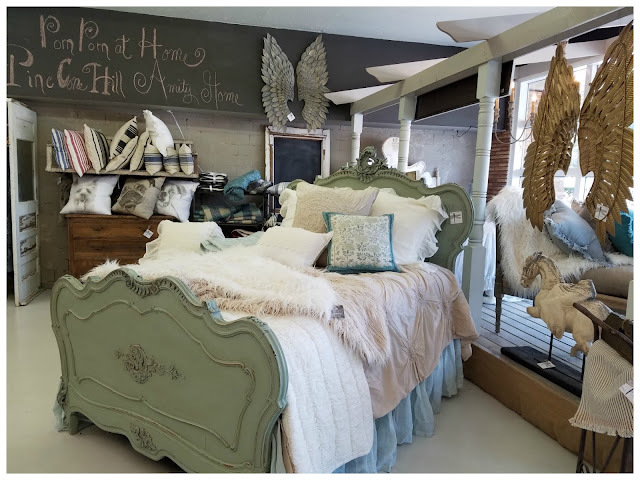 She carries Pom Pom at Home and Pine Cone Hill Textiles (above), and a nice selection of candles and infusers, along with a few food items (jellies, dip mixes, chocolates). 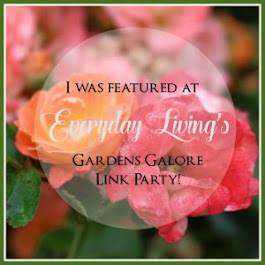 She had a garden section with faux topiaries, flowers, vessels, and statuary. 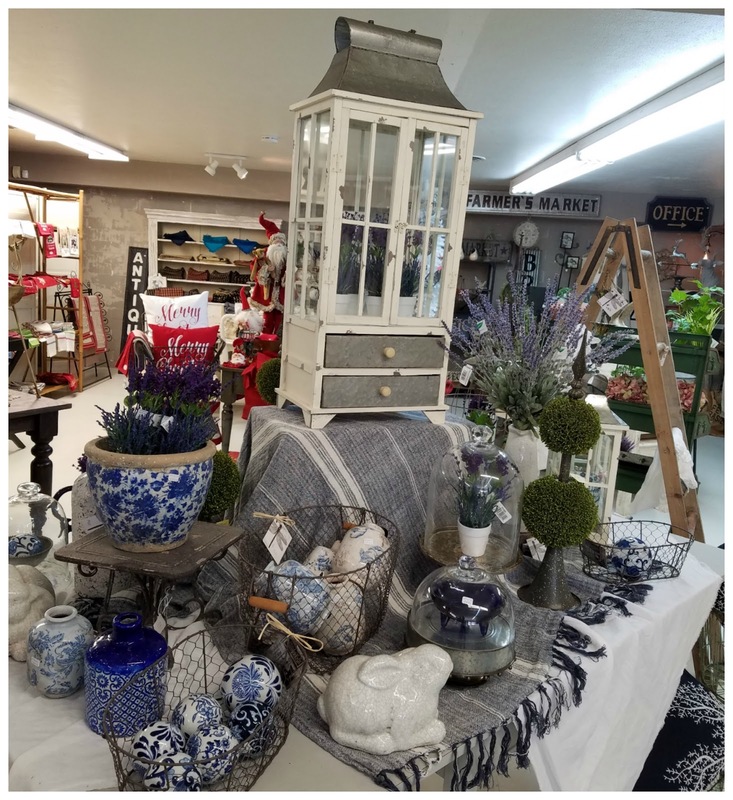 She tucked a few pieces of blue & white porcelains and ceramics, along with glass cloches, in the mix. Her holiday display was very attractive, too. There was a small section of traditional red and green in the back area. My favorite display was probably this huge parasol she had in the front window (below). Decorated for Christmas on this holiday opening, I could see the parasol being quite versatile for any season. 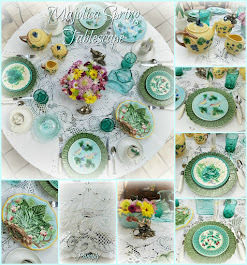 Imagine spring flowers! 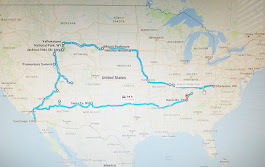 On this trip, we also took an extra day before the wedding events, intending to explore San Antonio, but the forecast called for thunderstorms, so we went about 45 miles south of the airport to the Webster area. 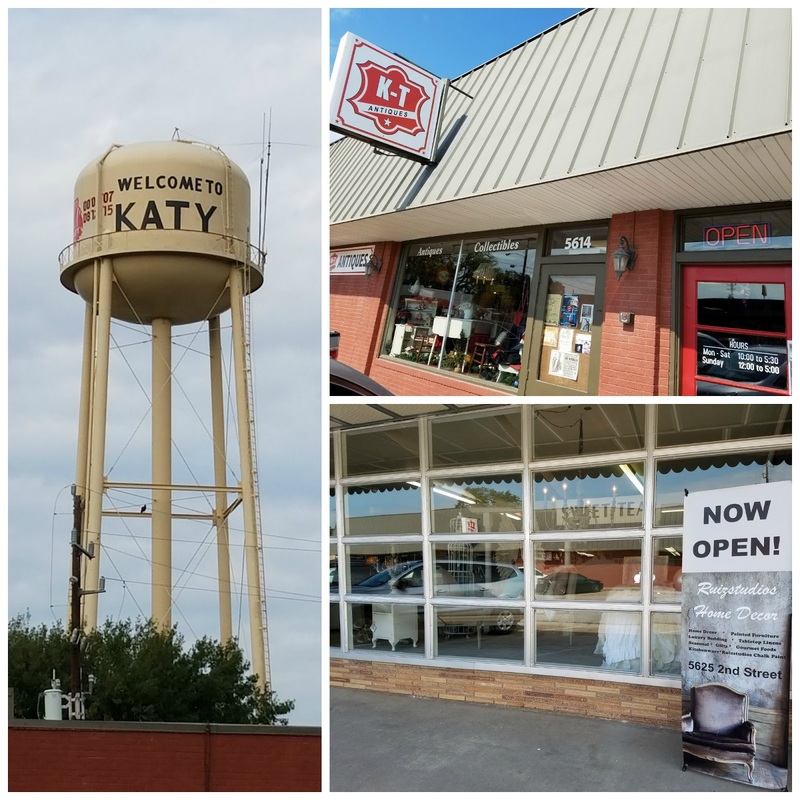 There, we visited the Johnson Space Center, but I also looked for antique shopping between Webster and Katy. 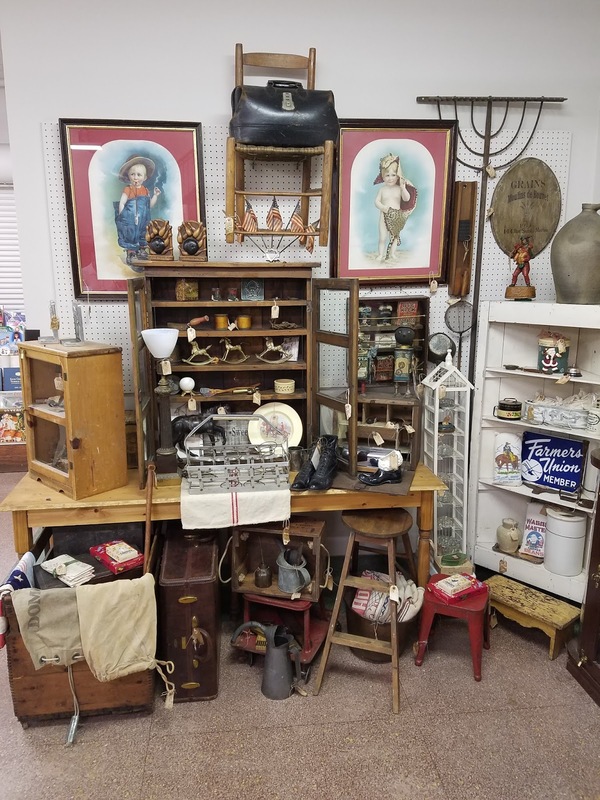 Using Google, I chose the Market Place Antiques and Collectibles for the prospect of finding several dealers in one locale. 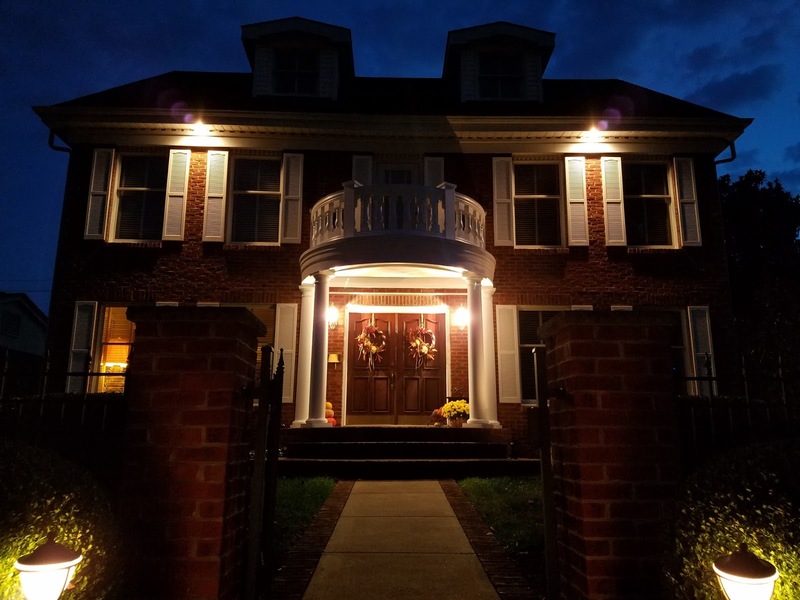 The website noted two buildings with 72,000 square feet, and nearly 90 dealers. The first building had a layout concept I have never seen before. You walked in, through the outside doors, into a hallway (see Mr. P. in the right frame of the collage above). There were glass enclosures for most of the dealers alongside the inside hallway. A few dealers were situated on the walking aisle. We were there on a Friday morning, 10 am, and there may have been 3 or 4 dealers there. I finally spoke to one man, a coin dealer, and asked him to explain this layout to me. He said each dealer manned his/her own booth, the dealers come and go as they please, and most likely the majority would not be there on a Friday. There was one dealer who apparently kept watch of a couple other dealers' spaces, and she had their doors open for shopping. Weird. The second building was more traditional in style, a large warehouse, but I was underwhelmed overall. Some of the vintage merchandise that I did not purchase, though caught my eye while on this trip, included all the items pictured in the collage below. The ironing board cover was repurposed from an old quilt, and had a nice pad included with it. 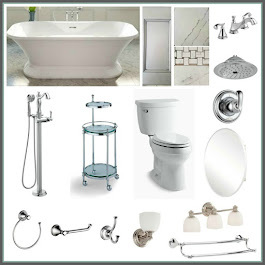 That, along with the brown transferware bath set in the upper right frame, were both in the KT Antiques location. What looks like an antique beaded purse is actually a stained glass with bead fringe. The wicker basket was HUGE - a hot air balloon basket! The latter items mentioned were in the Market Place Antiques. 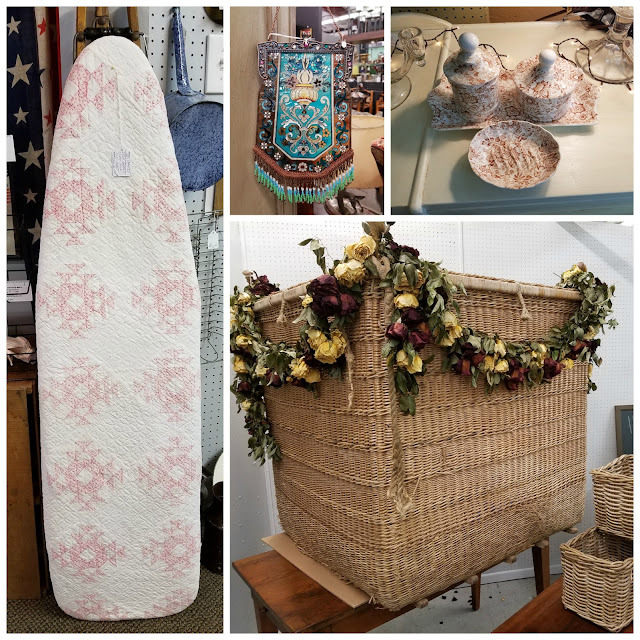 The things I did purchase on this trip are pictured below, all from KT Antiques (except for the vintage garden sign, spotted in Ruizstudios, and purchased with my winning gift certificate). 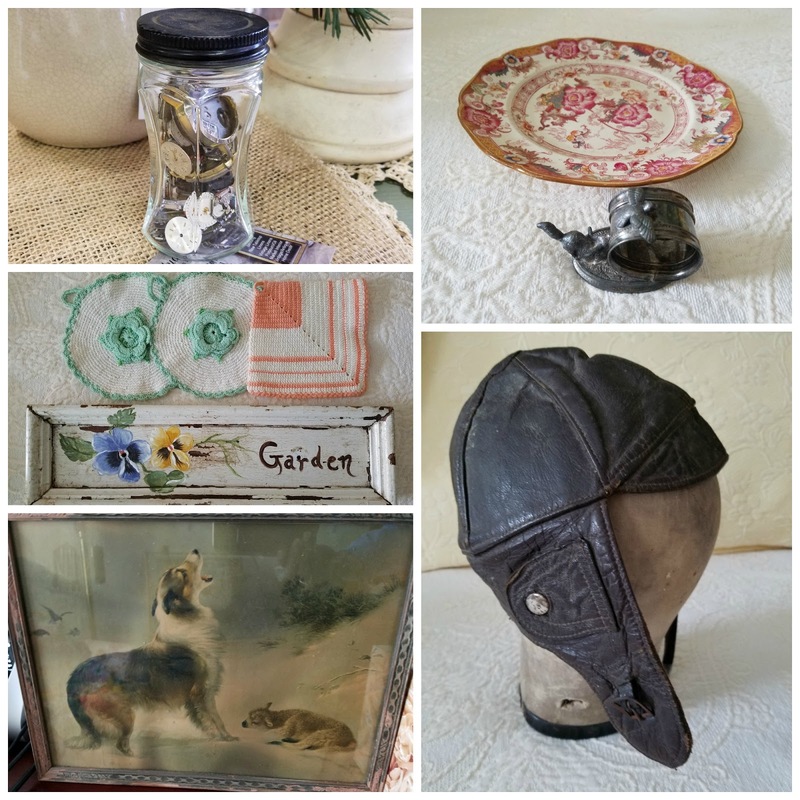 Clockwise from top L: a jar of vintage watch faces and timepieces; a polychrome transferware salad plate and figural napkin ring in front of it (dog chasing squirrel); a French pilot's leather cap from early 1900s, a color litho print of collie shepherd before a newborn lamb in snow (titled "Shepherd's Call", by Albrecht Schneck - 1828-1901); hand-painted garden sign, and three vintage, hand-crocheted potholders. I also purchased a few new items - couldn't resist. 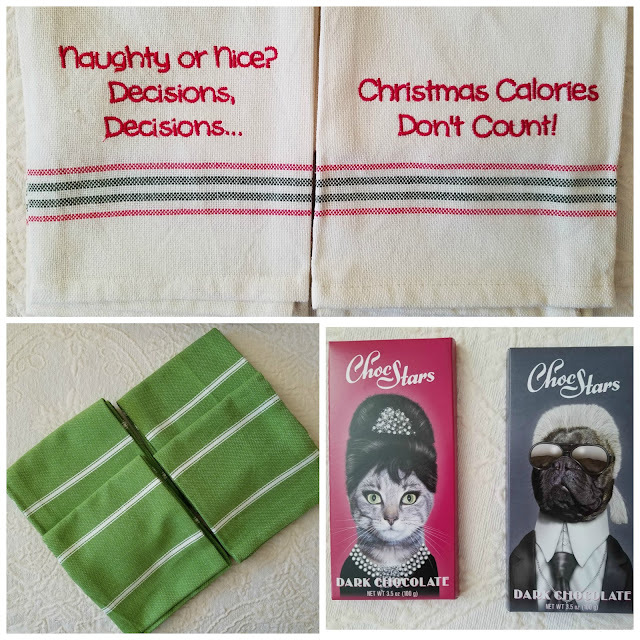 Seasonal, snarky dish towels - possibly hostess gifts; lime-green dish towels - possibly for a future tablescape; and the cutest dark chocolate bars - Choc Stars - I've ever seen, a product of Germany. Those will likely be part of door prizes for an upcoming, Tiffany-themed bridal shower I'll be co-hosting in March 2017. The items below all came from Ruizstudios in Katy. Of the shops I visited on this trip, I would highly recommend the Katy, TX shops (KT Antiques and RuizStudios). There were a few other shops - all of them clustered along 2nd Street - worth visiting, but I just ran out of time. 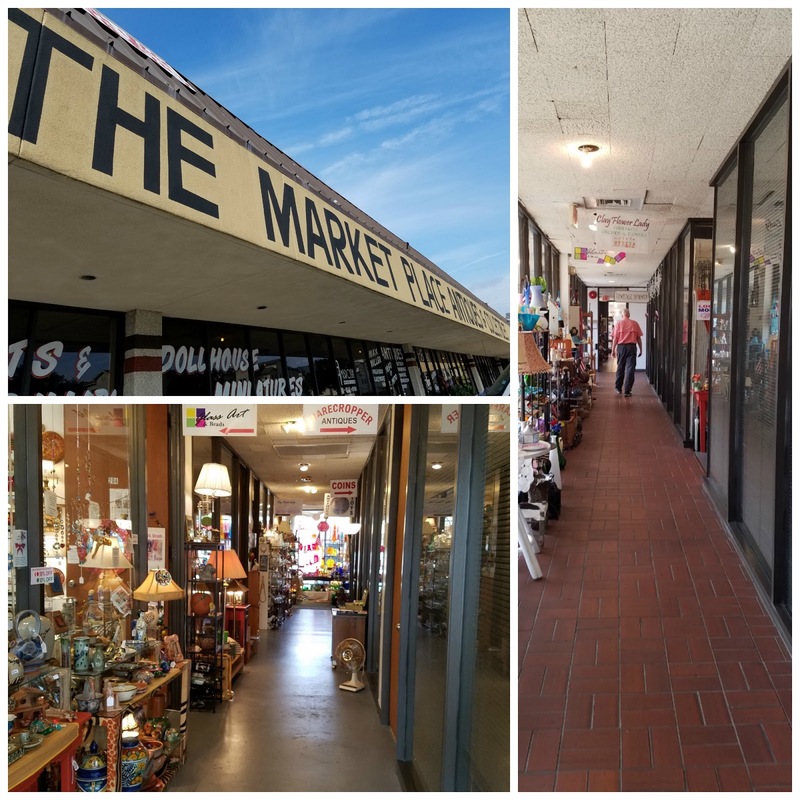 I would not necessarily recommend making an effort to visit Market Place Antiques between Webster and Katy. 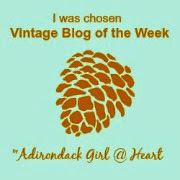 Have you done any vintage shopping lately, or found some new stores worth mentioning? 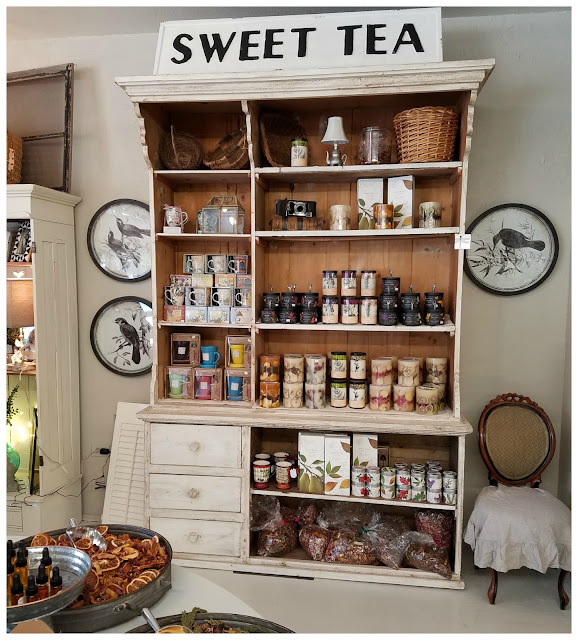 I always appreciate the mention, especially of vintage and antique stores, either in comments from readers or from fellow bloggers. One never knows when a trip might land you near a great shop someone has mentioned. 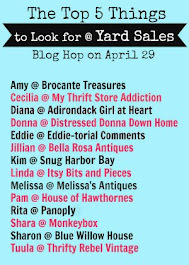 The chance to meet another blogger or reader in one of those locations would be the icing on the cake! Don't forget - November 26, 2016 is Small Business Saturday - a great opportunity to help small business owners by shopping their stores! Thanks for tagging along on my latest shopping trip. 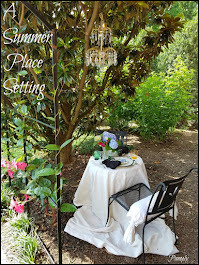 Your readership and comments are appreciated! 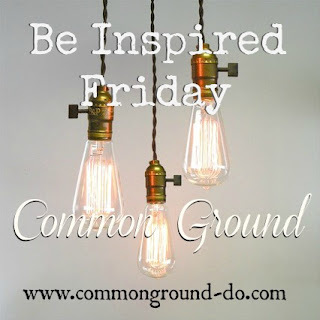 Please feel free to leave a comment here today. 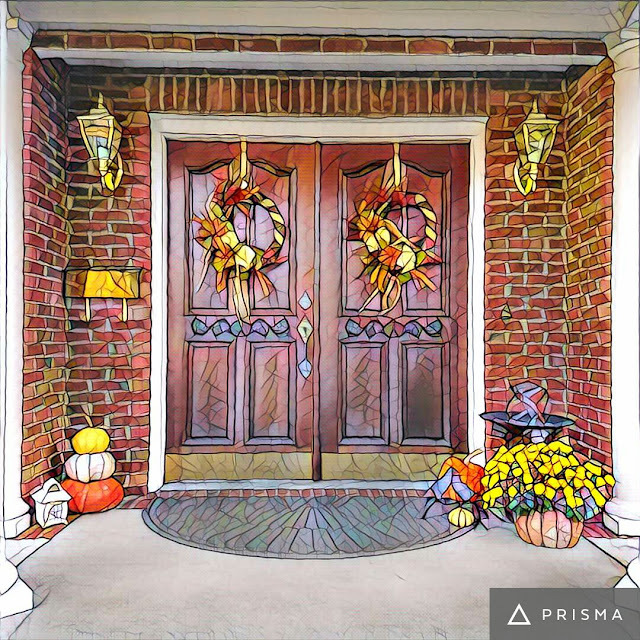 Panoply is holiday ready! 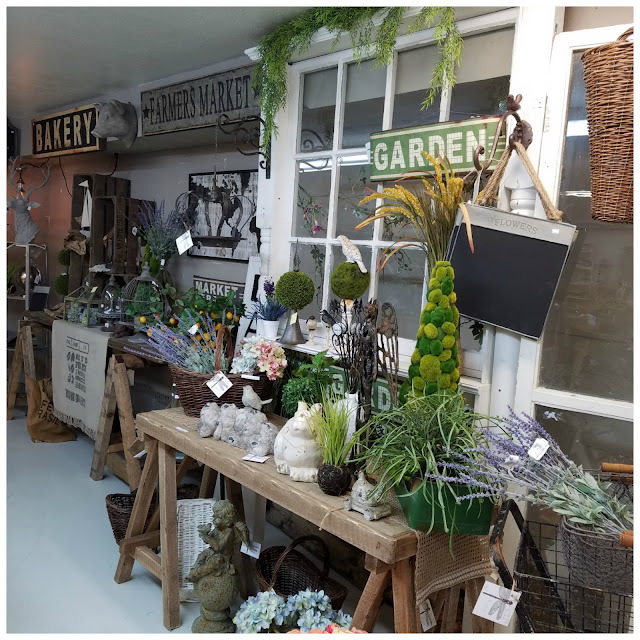 No, not at home, but in our spaces where we style and sell our vintage and antique wares locally. 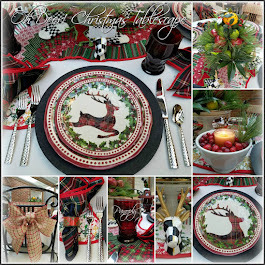 Intending to highlight the furniture pieces, the above space has only a few subtle touches hinting toward the holidays, A turkey platter, tree skirt, and various Christmas-themed smalls are scattered throughout. The space above is the transitional area just to the left of the space shown in the leading photo. We have a sort of "I'll be home for Christmas" theme with the vintage luggage on the aisle, moving on to the casual linens, with holiday-themed textiles added for the season. 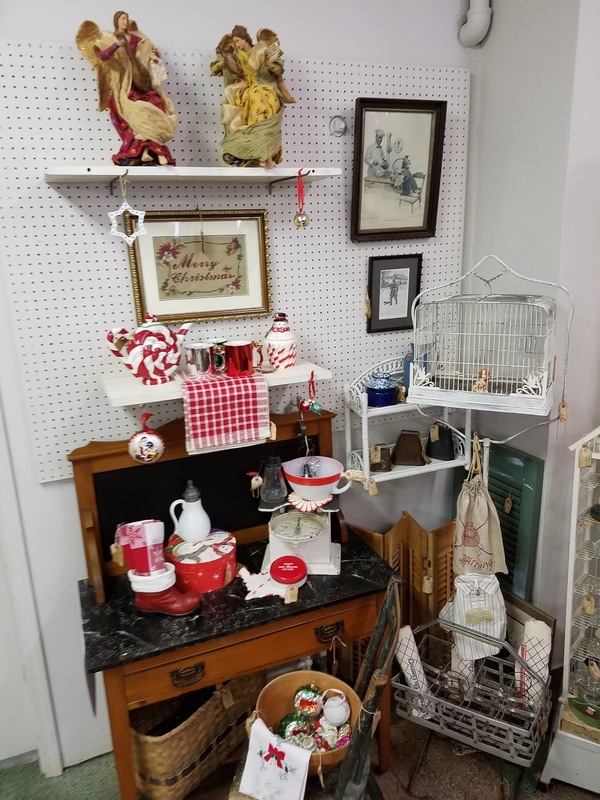 Just around the textiles rack in the transitional space is this little "Christmas kitchen" area, with seasonal items sprinkled around. The angels perched on the high shelves are clothed in Pierre Deux fabrics, really pretty. The "Mantiques" area has only a few holiday-themed items, but consistently displays things guys often gravitate towards. The space we call our "main booth" is where we mostly decked the halls for holiday staging. 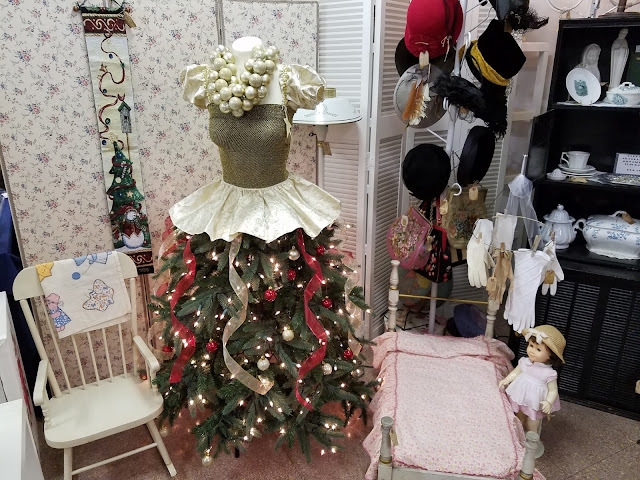 We brought back Miss Chrissy - our holiday mannequin tree - and situated vintage children's toys throughout the floor space. The back center now holds a sideboard table (the leaded glass fireplace screen sold! ), and beneath it are several toys, some of which are Amish-made. Near the tree we have a child's antique doll bed, Chatty Cathy, and a child's rocker. 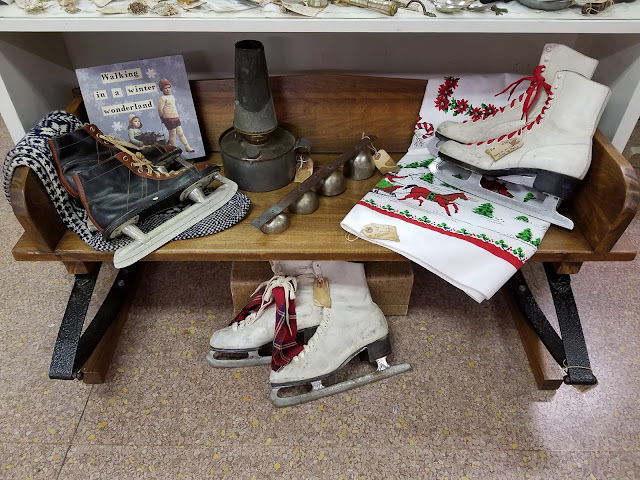 In front of the display case, we've set a winter wonderland scene with an antique wooden sled (unsold from 2015), a primitive lantern, vintage skates, sleigh bells, and textiles to warm the scene. 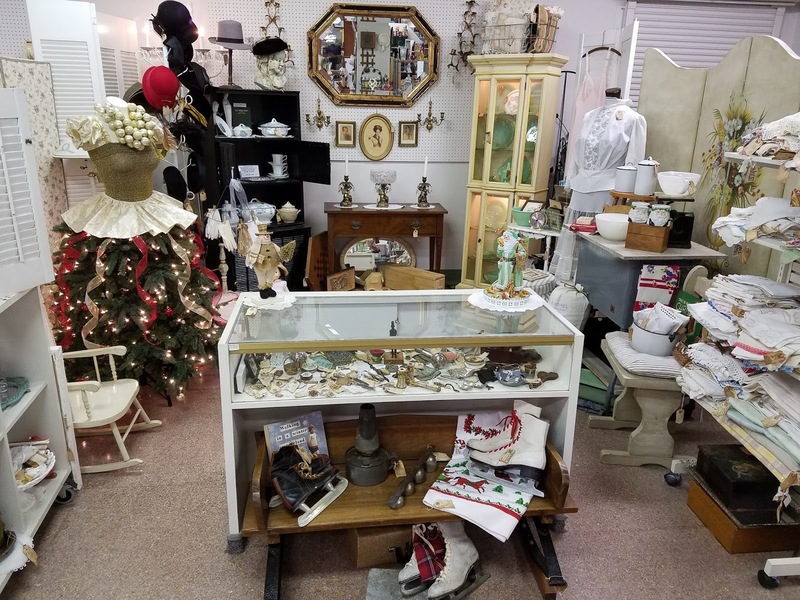 We are just three dealers among approximately 75 in an 18,000 square foot building, so having vintage holiday items ready early is important. 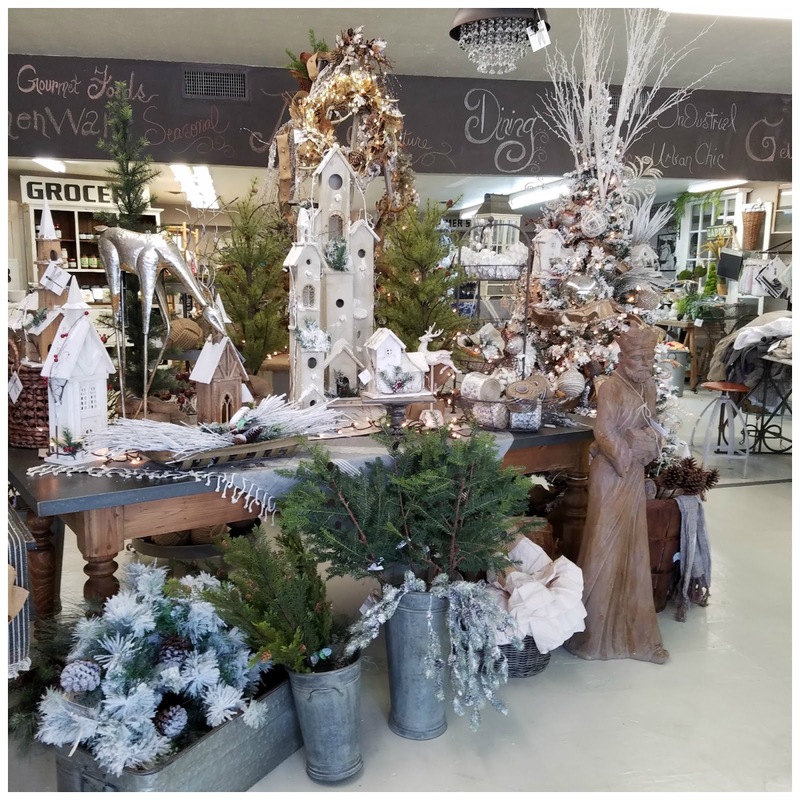 Since we will be having a store-wide open house the first weekend of December, and the fact that we are all busy with our own schedules at home in this season, we generally try to stage our holiday look in early November. 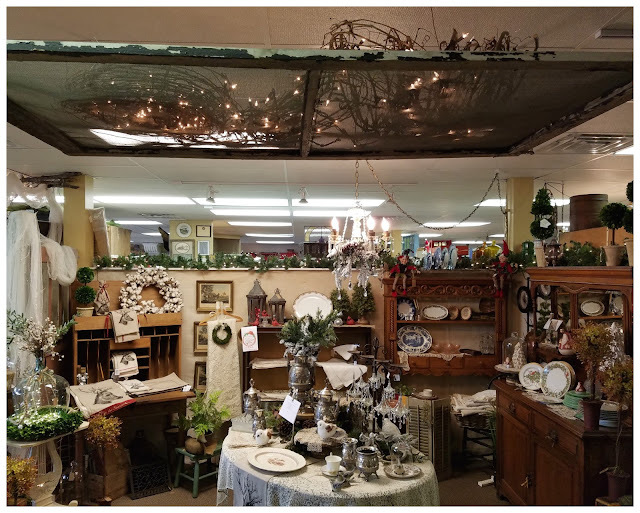 A first for me happened in the antique mall on the day we were staging our holiday items. A customer asked if I was Rita, and I assumed we had met somewhere before. Nope. 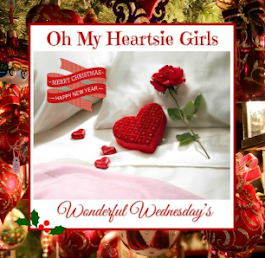 She was a blog reader from a town about 40 minutes west! She recognized me from my picture and our spaces. What fun it was to have a conversation with her and, in talking, found we have a mutual friend from the dance world. The reader I met was also a dancer, and we enjoyed that connection. 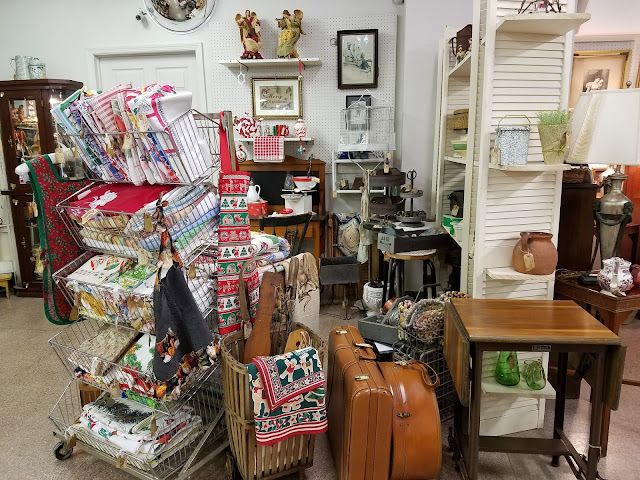 If you're in the neighborhood, come see us at the South Charleston Antique Mall, 617 D Street, South Charleston, WV. If you ever are, I'd love for you to contact me ahead of time - I may very well be free to come and meet you, too! In mid-September, I thought my magnolia was blooming again. 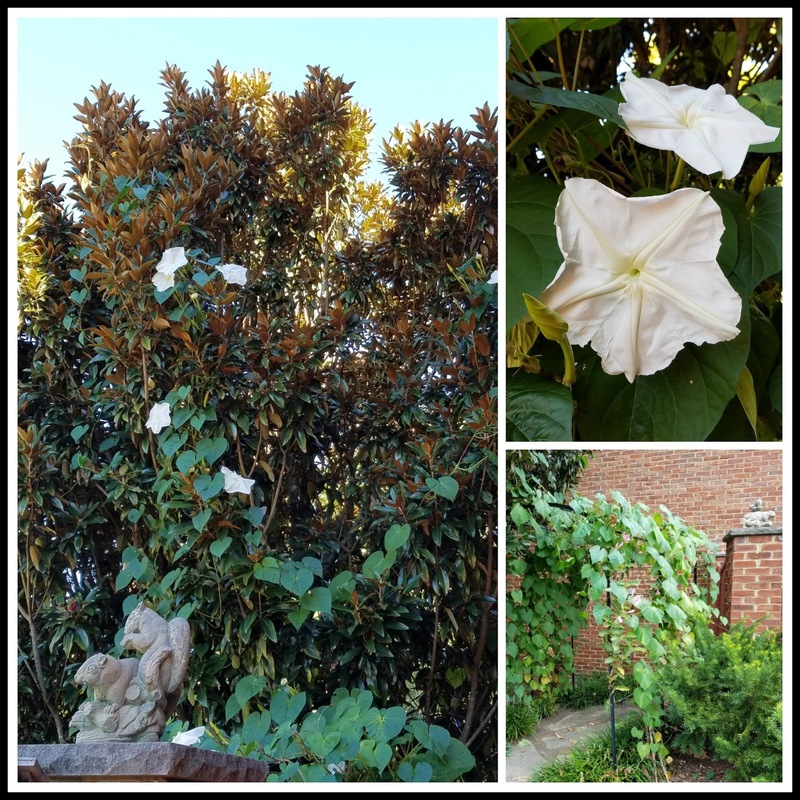 Lo and behold, my moonflower vine (first year planting) not only took over the trellis and overwhelmed the mandevilla planted on the same structure, but it made its best effort to take over the magnolia tree adjacent to the trellis while unchecked during our vacation in through August. 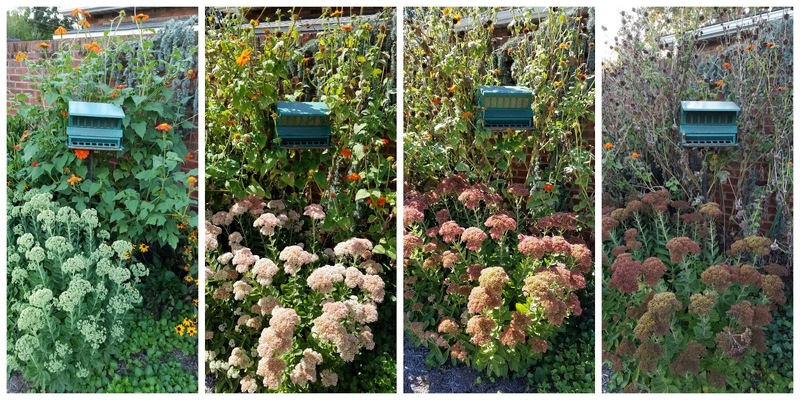 Sedum 'Autumn Joy' made a progression from August through October, going from green flower heads to eventual russet-colored blooms. Mexican sunflowers provided a backdrop behind the sedum and birdfeeder. I saved several flower heads from the Mexican sunflowers for next year. 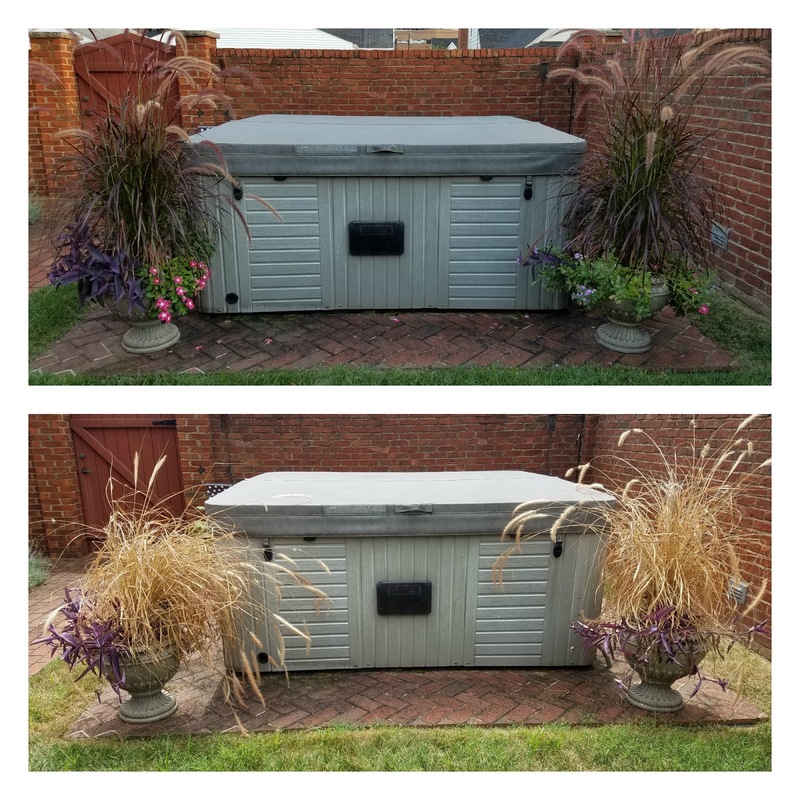 Containers were left on their own during our three-week August road trip, with no watering. The containers were lush when we departed, and pathetic upon our return.The courtyard containers, therefore, were the first in fall cleanup, early in September. 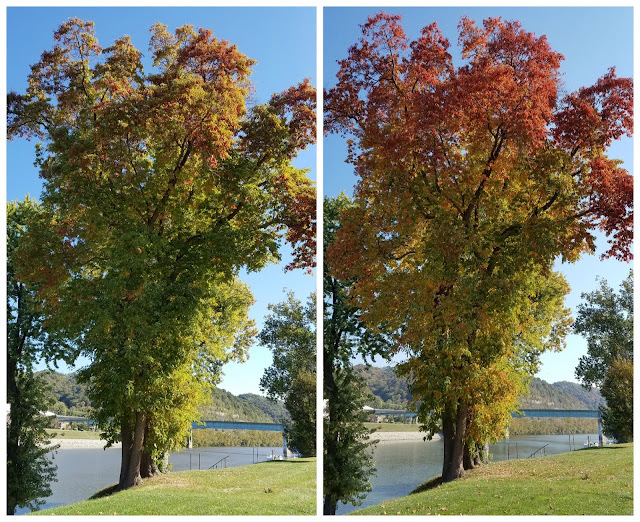 Two-week time lapse (mid- and late-October) of our sassafras on the riverbank shows the slow change of leaf colors. Notice the hillside in the background still very green. 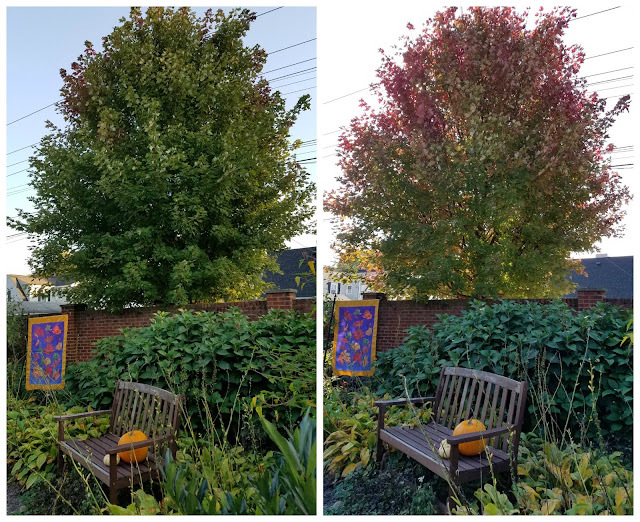 The same two-week October period time lapse view of my maple tree at the back of our landscaped lot (below). This tree is now the subject of controversy. The tree cutting contractor for the power company came knocking on our door in late September, wanting to cut the tree. I have written about this tree previously, with the stay of execution here, and lessons learned here. 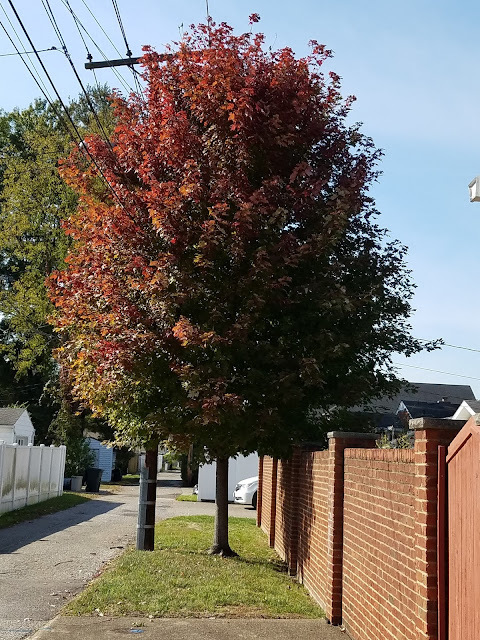 They offered either a sharp shearing or completely taking the tree out, due to the fact that it's grown beyond the highest voltage wire of the utility pole it was intended to camouflage in the first place. 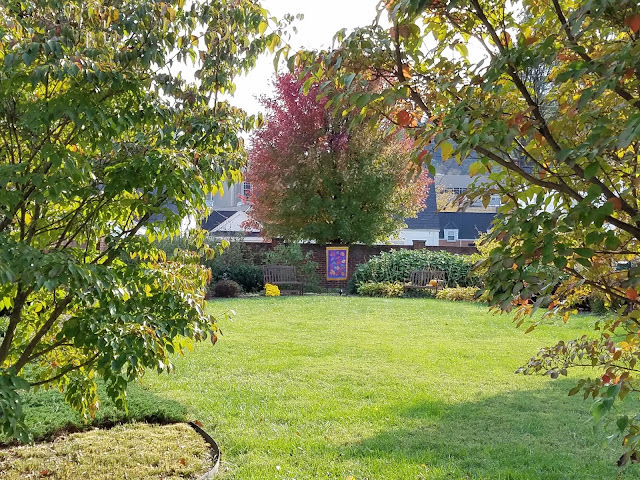 The tree is stunning in fall, and is the centerpiece of my landscape lot when viewed from the front of the yard. 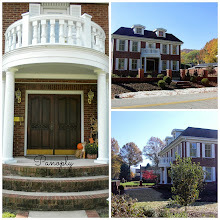 It also camouflages a lot of otherwise not-so-pretty sights in the neighborhood. Front to Rear View of Landscape: Maple at Center Back. I managed to shoo the contractor away until at least after the foliage turns and drops. The tree's fate weighs heavy on my mind after thriving for thirteen years in our landscape. The variety appears to bear characteristics of a silver maple (read huge), and will constantly need a heavy hand in pruning, ultimately hurting the tree. I know it needs pruning now, but would anybody like to weigh in with a viable, long-term suggestion/solution to the problem? I'm all ears. Otherwise, I'll likely just let them do a sharp shear until I have a long-term plan. Alongside the neighboring property, within our own landscape, we have a Japanese maple planted, which could possibly be one solution for the center back maple issue. 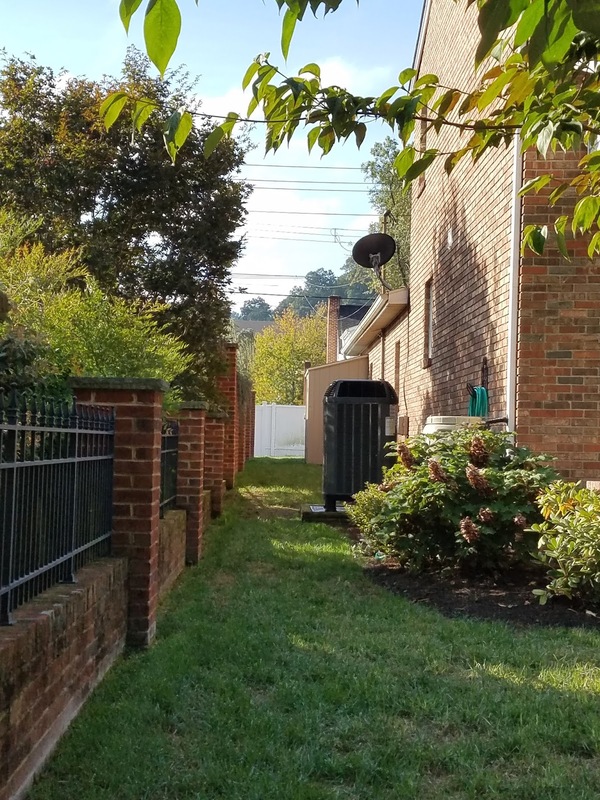 Below, you see the tree (left of frame, inside fence), just after being trimmed, so as not to encroach on the neighbor's lot. Our property extends another two feet to the right of the fence, intended for ease of moving our lawnmower from front to back. 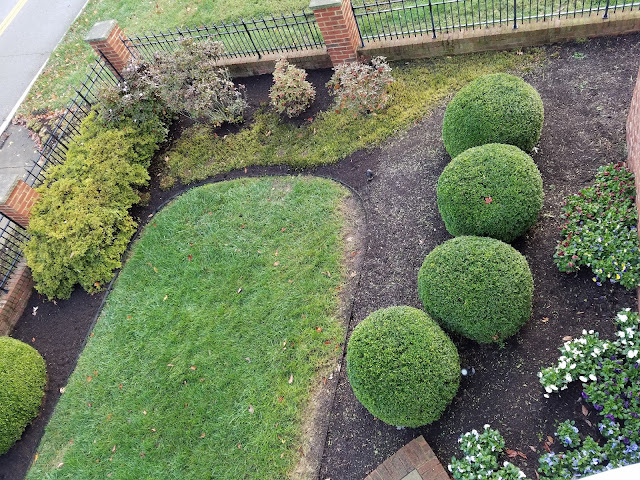 From inside our landscape, our mature plantings mask viewing all of the neighbor's equipment, even when the leaves drop. Clean up throughout the landscape is underway. 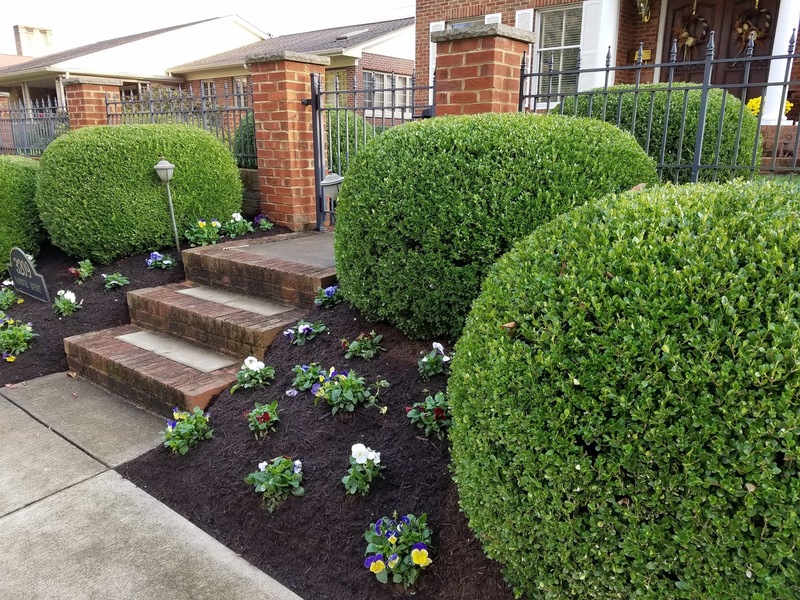 For this, I contract a gardener who has been with me since the initial plantings. He is meticulous, methodical, and understands me. Here's an example of how messy things got in the garden before the cleanup. Pictured below is one corner, BEFORE cleanup (the spirea in foreground had already been sheared). 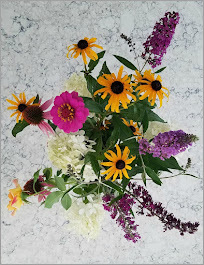 Butterfly bushes, hostas, Mexican sunflowers, Otto Luykens were all just one big tangled mess. Here's the AFTER cleanup. Separation of powers. Checks and balances. Law and Order. The mums were a previous year's front porch remains and did well as a perennial this year. 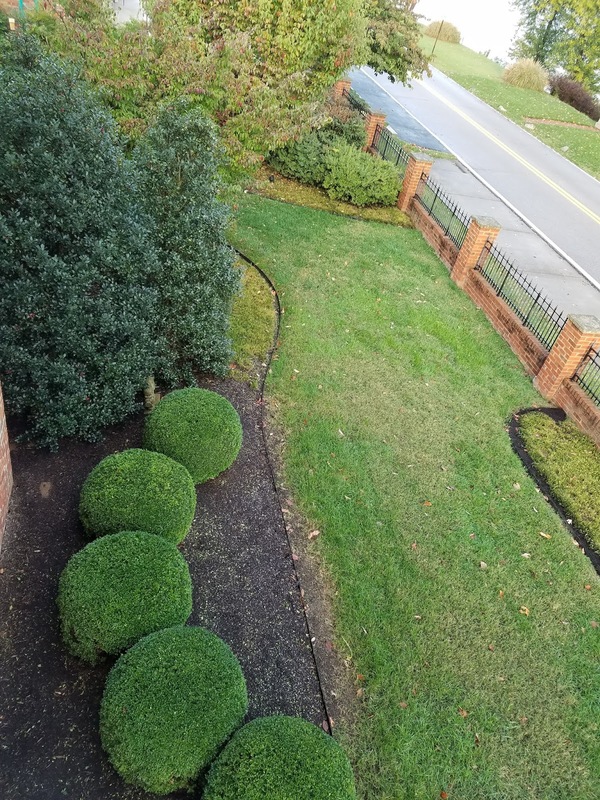 AFTER: back landscape, pruned. 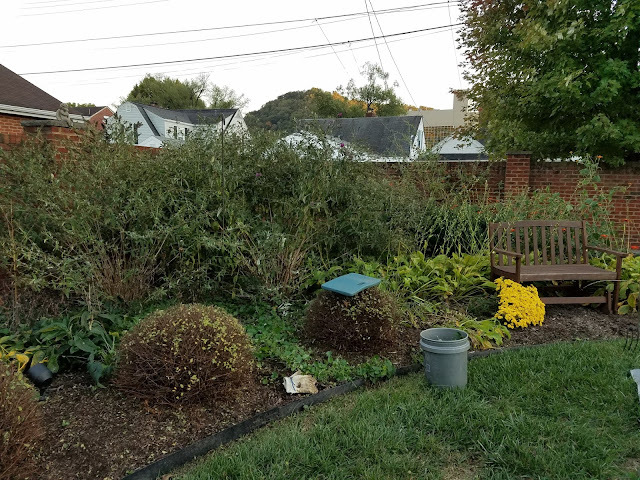 Butterfly bushes are on left, hostas surrounding glider. 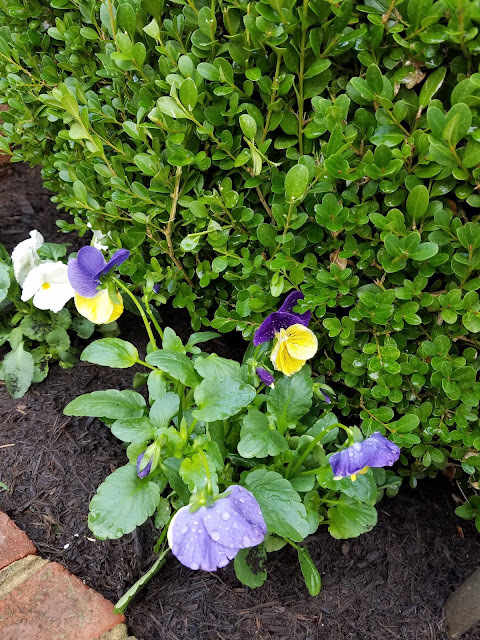 Annual flowers in the front beds have all been pulled, and the pansies are getting tucked in their place. 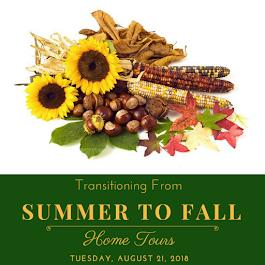 They will last through winter, into spring. 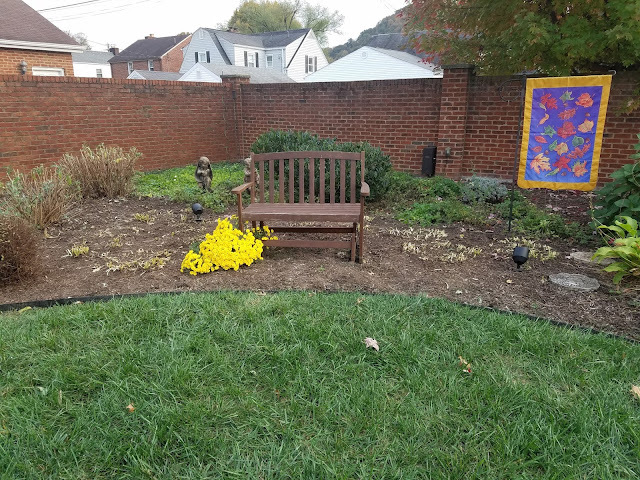 More daffodil bulbs will be planted in and among the annual beds closest to the house, along with the remaining pansies (sitting alongside the house wall in photo below). You can see how, against my beds near the steel edging, the summer annuals encroached on the lawn grass. Those front borders will need amended. Next year I plan to keep the summer blooms from spilling over the grass. 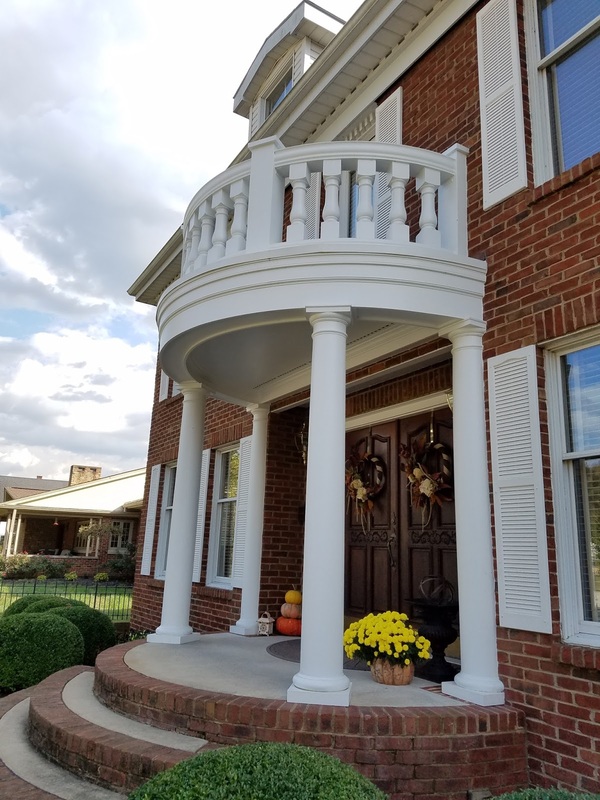 I'll find a place to tuck the front porch mums once the blooms are spent, but they're still going strong. I purchased the mums and pumpkins the first week of September. The pumpkins are all still firm, too, in spite of the continued warm temps. 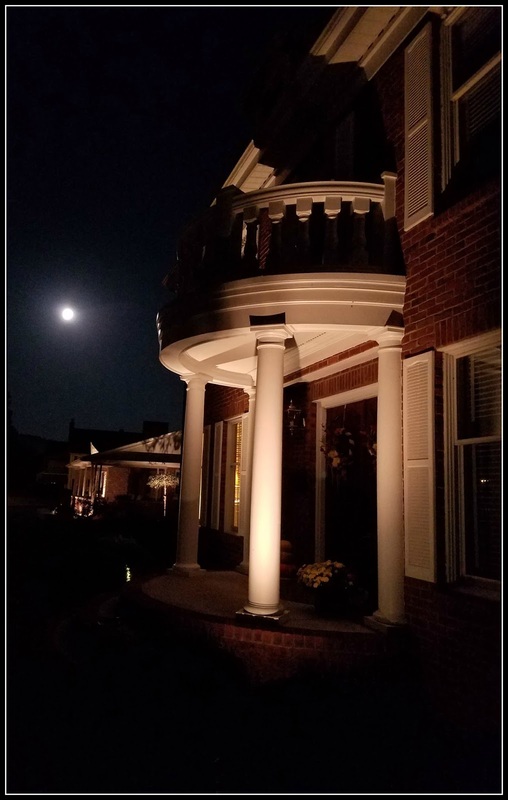 I managed to catch the harvest moon one evening in mid-October, from the same angle as the photo above, standing just a little further away. As I was sitting/standing on the porch and front walkway for Trick-or-Treaters, the lights on the house made for a nice photo opportunity. Five months later, the balcony rebuild is a confirmed success. Lest my readers think I'm raging war with all spiders, I want you to know I don't mind them out in the garden. It's just at my doors and windows (and inside the house) that they are not welcome. 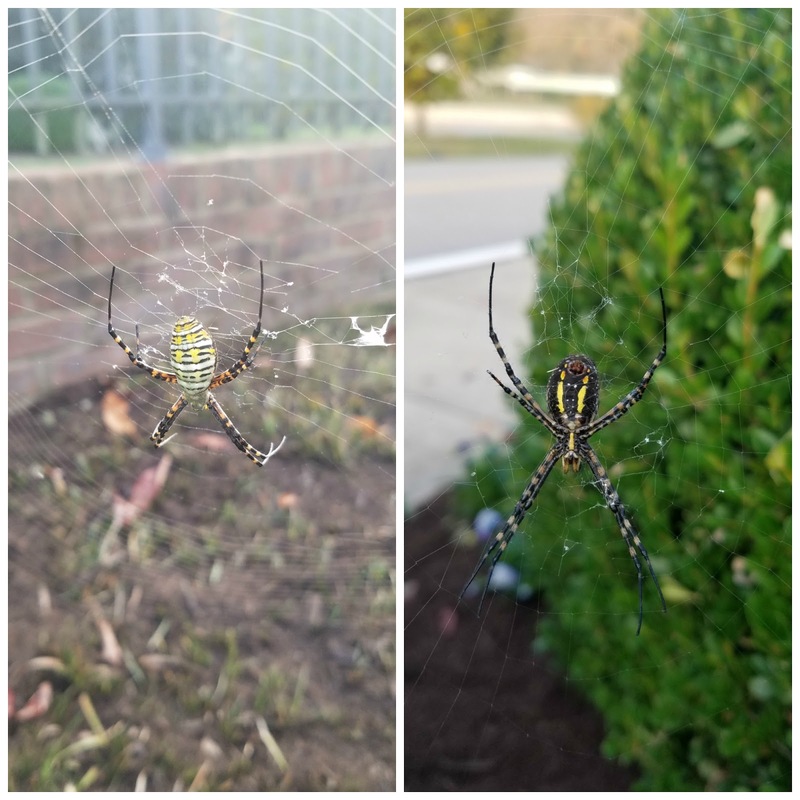 Here's a resident St. Andrew's cross spider (aka argiope, writing spider), making his web over the last week or so in front of the gate, between boxwoods. He's still there as of this publish date. Contrary to some spiders, we have no tolerance for Canadian geese in our neighborhood. Below is the result of unplanned parenthood for these fowl for just one season. 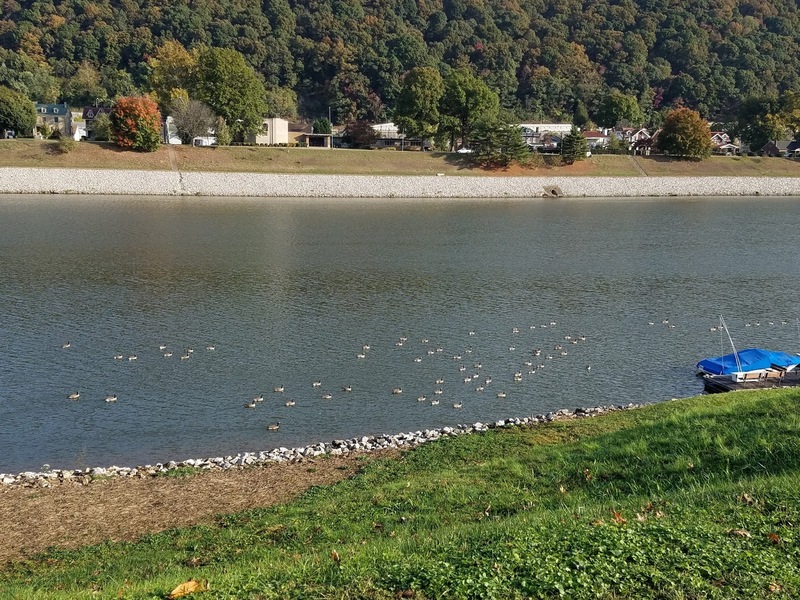 We've counted roughly 78 geese, or 7.5 dozen, consistently going up and down river along our 3-4 block area lately, but it is an ongoing issue. They are disgusting. They come onto the riverbank, into the street and our yards, either by wading or flying in, eat the grass, and defecate constantly. An article in the Washington Post (link here) this past summer had a brilliant solution of capturing and euthanizing an overpopulation of these birds to feed the homeless in Maryland. We would be happy to see a similar initiative here. Winter makes for tough patrol duty, chasing them away. We use a super soaker squirt gun, and have not had any chase us. Yet. 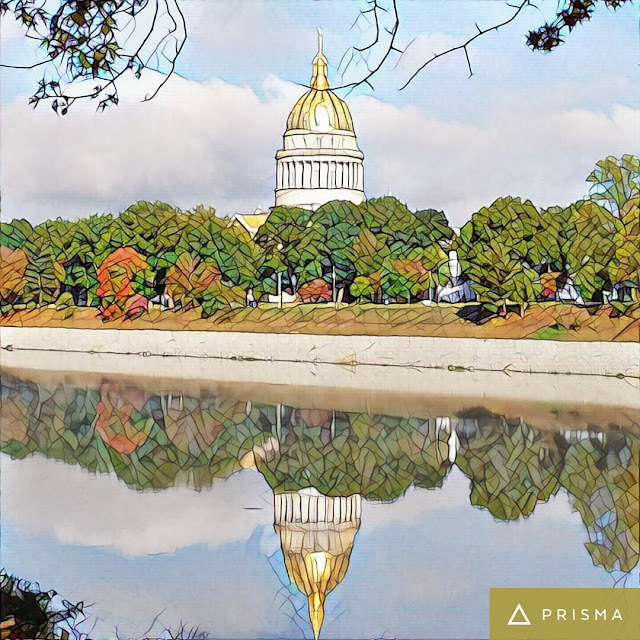 Instead of leaving on a sour note, how about a great shot of our Capitol building I took this fall, as altered through the Prisma app? Thanks for your visit today. 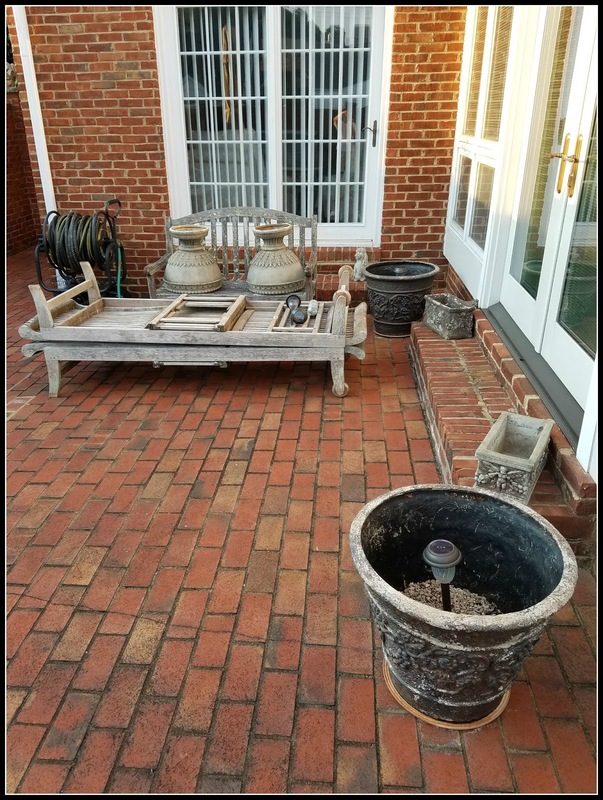 Are you busy tidying up your garden, containers or otherwise, or will you let it just 'be' through winter, and clean it up in spring?